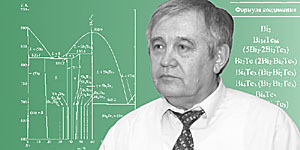 Academician Feodor Andreevich Kuznetsov is an outstanding specialist in physical chemistry and material science. He ranks among the leading experts in our country and abroad in the field of development the scientific basis to create materials for microelectronic equipment, for quantitative methods of the analysis of inorganic materials, for multicomponent systems to grow crystals and layers out of a gas phase, and for theoretical principles and methodology to thermodynamically simulate processes of synthesis of these materials and structures. The basic directions of scientific research of F.A.Kuznetsov involve the development of physicochemical principles for creating tailor-made materials and structures for microelectronics and optoelectronics, experimental and theoretical-computational studying the processes of synthesis and degradation of the materials and structures, working out new technological processes and instrumentation, and materiology computer science. As a consequence of these researches, a methodology has been developed for quantitative investigation of a type of processes that is mostly employed now in microelectronic technology, namely, chemical precipitation from gas phase, the information aspect has been substantiated and technique has been worked out for thermodynamic simulation of the processes to synthesize the materials and structures. Extensive investigations have been made on the interrelation of the structure and the composition of a substance of the multilayered structures that make up the basis of the elemental base for computer facilities with physical parameters. F.A.Kuznetsov has made much for the organization and development of the information support of the investigations into material science and structural chemistry. Under his guide, a databank of material properties for electronic equipment (SMET) has been created in the Institute that included a database of crystal structure and a complex of original codes for verification of these specific data. Since 1983 to 2005, F.A.Kuznetsov held the position of the director of the Institute of Inorganic Chemistry; currently he is an adviser of RAS. Feodor Andreevich combines the research with an active pedagogical work in Novosibirsk state university where he is the head of a sub-faculty. F.A.Kuznetsov is the president of Asian-Pacific Academy of materials APAM. In IUPAC, the International Union of Pure and Applied Chemistry, he is a member of the ChemRON committee "Chemistry for the needs of humanity" that is engaged in the organization of the major conferences of the Union. A national representative in CODATA, the Committee on numerical data for science and technology, he heads a working group on gas hydrates, and he is a member of editorial boards of some foreign magazines. Academician F.A.Kuznetsov is the author of more than 400 learned works, the recognized head of the scientific school; he got government awards. Scientific achievements of academician F.A.Kuznetsov have been rewarded with the State premium for a cycle of investigations into chemical thermodynamics of semiconductors (1981) and with other awards. * Sources: 1) F.A.Kuznyetsov (k 60-lyetiyu so dnya rozhdyeniya) // Izvyestiya Rossiiskoi akadyemii nauk. Syer. khim. nauk. - 1992. - N 9. - S.1962-1963. 2) K yubilyeyu akadyemika F.A.Kuznyetsova // ZHurnal strukturnoi khimii. - 2002. - T.43, N 4. Dokumyent izmyenyen: Wed Feb 27 14:46:36 2019. Razmyer: 9,119 bytes.